School and soon the holidays are looming right around the corner and the days of the kids being on their lazy summer schedules will soon come to a close. Whether back-to-school season means getting the children back into their early morning routines or running the neighborhood carpool, your home is going to need to get organized! We have all muttered this phrase all too often: “This is it! This is the year I get my act together, stay focused and get organized. This will be the best year ever!” Back-to-school season brings out the organizational bug in us all, yet it can be overwhelming far before it is satisfying. These helpful ‘Do It Yourself’ ideas will ease everyone into the back-to-school season with simple ways to organize your home and lifestyle before the hectic school year is underway! Don’t be afraid to grab a garbage can and get moving. 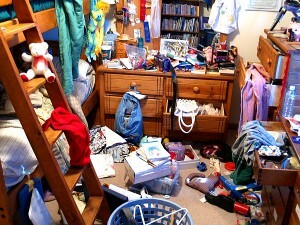 When faced with the challenge to declutter, simply enter a room and quickly toss everything away that is obvious trash. Try to move as fast as you can without over thinking your decision. Broken toy? Toss it. Last year’s invite to your son’s best friend’s birthday party. Toss it. These are items you don’t need. Once you have filled your can, tie off the top and bring it outside immediately and move on to round two. -If you don’t need it, toss it. -If you can’t remember what it is or where it’s from, toss it. .
-If you don’t know remember when the last time you used it was or when you will use it again, toss it. It’s just taking up space. Release the excess clutter and reclaim your home. The less ‘stuff’ you have lying around, the less time you will have to spend on cleaning in the future. If kids feel as though organizing the house is a boring job exclusively for parents, they will be cranky when asked to help. Show them it can be fun! Instead of basic clear bins and wooden baskets, invest in some colorful storage bins with fun patterns, or better yet, have the kids create custom, DIY boxes for their belongings. Several organization and container stores have color coordinated hooks, shelving, bins and even labels. This is a great way to creatively organize everyone’s school and play items. Not only will they make cleanup time more fun for the youngsters, but they can also prevent siblings from fighting over who’s cleaned up and who hasn’t! To continue this lifestyle throughout the school year, follow a similar routine. Ensure that homework areas are always filled with school and educational amenities that allow for the creative minds of your children to organize their schoolwork and artwork. Before class begins, let your children customize their desk or workspace so that they look forward to studying and spending time there. Don’t bring more clutter into an already cluttered home. When you are out shopping stop and ask yourself: “Do I really need this, will I use it often enough to make it worth it, do I really love it?” If the answer is “yes”, then bring it on home and make sure you have a spot for it stored away. If it is replacing something you already have, be sure to get rid of the old item. It may even be smarter to get rid of the old item before purchasing the new one to be sure that you have space for it. If you are prone to buying items you don’t necessarily need, create a rule for yourself where you must get rid of one or two things for every new item you bring into the house. This can help with the compulsive shopping and leave you knowing exactly which items you own and need. The effects of stress don’t only just land on the parents. Studies found that high levels of anxiety in parents increases their children’s risk of developing asthma and allergies. Even worse, kids whose parents have a clutter collection often keep their lives in their own messy mountains of junk. If you are not organized yourself, don’t expect your kids to be.